A guide from Far and Wild Safaris will collect you from your overnight accommodation in Port Elizabeth, or from the airport in Port Elizabeth and make our way to the Addo Elephant National Park. Deep within the shadows of the dense valley bushveld of the Sundays River region of the Eastern Cape is the Addo Elephant National Park. Here, the evenings are punctuated by the strident howl of the black-backed jackal, and the francolin's call heralds each new dawn. Safe from relentless persecution in the past, the grey leviathans of the bush now roam in peace. This park conserves no less than five of South Africa's seven biomes, is also home to one of the densest African elephant populations on earth and is home to the unique flightless dung beetle. You can opt instead for the luxurious Gorah Elephant Camp instead of the Addo Restcamp. The incomparable thrill of quietly observing a passing herd of elephant while being served tea on the veranda of a stately Colonial manor house is the stuff of dreams and legends - at Gorah it's an everyday occurrence. This exclusive safari lodge recaptures the romantic mystique of authentic safari of centuries past - the awesome natural world of Africa merged with colonial nostalgia and modern sophistication to deliver an unforgettably unique 5 star adventure. Gorah is the only private concession situated in the middle of the famous Addo Elephant National Park Gorah is malaria-free, a Big 5 lodge. After breakfast we depart for the Mountain Zebra National Park. The craggy heights of the Mountain Zebra National Park's Bankberg embrace rolling plains and deep valleys, and have become an entrancing preserve for the Cape mountain zebra. The proclamation of the park in 1937 saved these animals from extinction, and currently their population stands at more than 300, where they roam 28 412 hectares of land. Other mammals found here include the cheetah, Cape buffalo, black rhino, eland, black wildebeest, red hartebeest and gemsbok, while mountain reedbuck and grey rhebok frequent the higher areas. Our accommodation here is in four-bed family cottages, each with two bedrooms, bathroom and partially equipped kitchen. This afternoon will be spent on extended game drives into this park. The highlight of the park's mammalian fauna is obviously the ±300 or so Cape Mountain zebra after which the park is named. These zebra differ from the plains or Burchell's zebra, by having narrower stripes, absence of shadow stripes and orange facial colouration. Other noticeable species of the mountain plateau are the red hartebeest, eland and springbok. In the more wooded valleys we should search for kudu, and two of the park's more recent reintroductions, the African buffalo and the black rhino. Verreaux's (Black) and Martial Eagle and Jackal Buzzard soar impressively over this mountain habitat. Pale-winged Starling is very conspicuous on the mountain plateau, where Ostrich, Secretarybird, Blue Crane and Ludwig's Bustard are the larger more visible species. Grey-winged Francolin, Ground Woodpecker, Large-billed (Thick-billed) and Eastern Long-billed Lark, Cape and Sentinel Rock-Thrush, Mountain Wheatear (Chat) and Orange-breasted Rockjumper should also be searched for, while Pink-billed Lark and African Rock Pipit are less common. The wooded kloofs and acacia stands host species such as Red-fronted Tinker Barbet, Lesser Honeyguide, Red-throated Wryneck and Southern Tchagra. After breakfast and a short game drive we make our way to Samara, arriving there in time for lunch. A heart stoppingly beautiful African setting waits at the award winning Samara Private Game Rreserve. Two elegant lodges are nestled on open plains between an amphitheatre of mountains. The 70 000 acres of private Karoo bushveld offers breathtaking and far reaching views, 4 biospheres, dramatic mountains, complex and diverse eco-systems, 60 mammal species including Cape Mountain zebra, giraffe, rhino, buffalo, majestic antelope, aardvark and cheetah. Part of Samara's cheetah conservation success is the fact that Samara is free of the predator competition found in Big 5 reserves. Without the pressure of natural predators such as lion and spotted hyena, the Samara cheetah populations have been able to thrive. Samara works closely with De Wildt Cheetah and Wildlife Trust to ensure that this highly endangered species is given the best chance of survival. To this effect Samara swaps it cheetah populations with other reserves thus ensuring that the gene pool is as wide as possible. The lodges offer exceptionally elegant accommodation with outstanding service and Karoo cuisine. Dine under the stars, picnic on a cliff top or simply enjoy private meals in a variation of secluded locations. You may also indulge in relaxing spa treatments in the Samara spa or on the waters edge and visit ancient fossil and rock art sites. Whether ensconced in the comfort of an open game viewer, or trekking through the fragrant Karoo bush, you will feel the deep pulse of the Karoo that makes Samara truly magical. Discover the secrets of Samara as you explore the untouched Plains of Camdeboo that once staged the massive migrations of millions of Springbok. Fossils that predate the dinosaurs and well-preserved Bushman paintings offer a fascinating insight into some of the historical intricacies of our Earth's past. Today will be spent on game drives and enjoying what Samara has to offer. Samara's abundant wilderness preserves a complex and diverse ecosystem, providing habitat for over 60 mammal species. Among more common species, such as the Kudu and Duiker, the secretive Aardvark and the once-endangered White Rhino roam. Giraffes can be seen peeking over the thorny Acacia canopy, while Cheetah crouch, hidden in the grass, waiting for an opportunity to stretch their legs and test the speed of the Hartebeest. Whether ensconced in the comfort of an open game viewer, or trekking through the fragrant Karoo bush, you will feel the deep pulse of the Karoo that makes Samara truly magical. Discover the secrets of Samara as you explore the untouched Plains of Camdeboo that once staged the massive migrations of millions of Springbok. Begin the journey of revitalisation on your 'birding safari', where you can witness the hauntingly beautiful Blue Crane mating dance, soaring pairs of Black Eagles near Eagle Rock, witness the strutting Secretary Bird and marvel at the wing span of the Kori Bustard - also plant a spekboom and explore the ancient rock art before relaxing for an afternoon of indulgence with spa treatments, Karoo cuisine and sunset game drives. This morning after our last game drive at Samara and breakfast, we head out to any of the many, good private game reserves in this province. As dawn breaks over the African bush, a gentle tap on your door will wake you to the delights of a new day. Your ranger will discuss what you hope to see that day over fragrant tea or coffee and morning biscuits or rusks. Set out in an open 4x4 safari vehicle in the company of a ranger and tracker team, who will attempt to track your favourite animals. 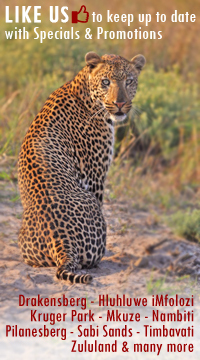 Explore Kwandwe's diverse terrain in search of cheetah, black rhino or elephant. Cool off with a refreshing dip in the pool or indulge in an afternoon siesta. Over a late afternoon tea, your ranger will discuss what you hope to see during the afternoon game drive. This game drive begins in the late afternoon and lasts until after dark, when spotlights are used for a glimpse into the nocturnal bush life. Spot the rarely seen porcupine, aardwolf or aardvark. Enjoy sundowners in a scenic location as the sun slowly sinks beneath the horizon. Return to your lodge for a mouthwatering dinner around a blazing fire in a boma or in your lodge's dining area. After your morning game drive and breakfast you will be dropped of at your overnight accommodation in Port Elizabeth or at the airport in Port Elizabeth in the early afternoon for your return flight.